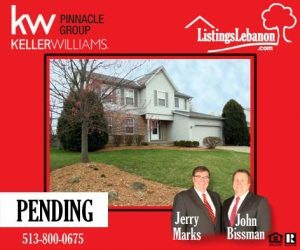 Pending Listing – 773 Oleander Ct, Lebanon, OH 45036 – New Carpet and Fresh Paint! New Listing – 773 Oleander Ct, Lebanon, OH 45036 – New Carpet and Fresh Paint! Desirable 4 bedroom 2.5 bath home with marble, wood burning fireplace and partially finished basement. Fresh paint and new carpet throughout. Master suite has a walk in closet and the adjoining bath boasts dual vanities and separate tub and shower. Priced to sell!